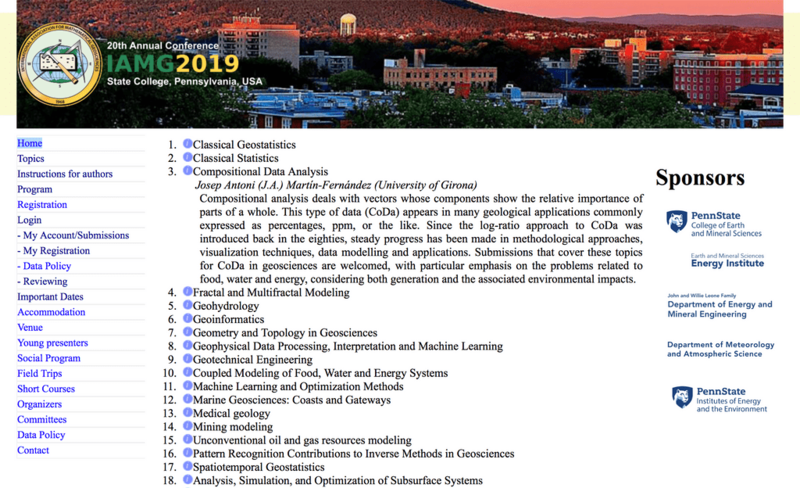 The International Association for Mathematical Geosciences (IAMG) will be holding its annual conference at State College, Pennsylvania, USA, 10−16 August 2019. Note that this date is earlier than previous conferences. IAMG2019 organizes a session dedicated to CoDa chaired by J.A. Martín-Fernández. - Abstract submission: a 250 to 400-character abstract should be sent to the organizers. The deadline is 8 January 2019. -- Results of the abstract evaluations will be announced on 4 February 2019. Once your abstract is accepted for presentation, you can submnit an extended abstract by 15 April (3‒5 pages long). -- Once your extended abstract passes the peer-review process, it will be distributed among the participants. After the conference, the Editors-in-Chief of the IAMG journals will invite selected papers for publication. Please do not hesitate to contact josepantoni.martin@udg.edu if you need more information. For more details about the conference, please visit http://www.iamgconferences.org/iamg2019/.